This is going to be a place for me to share non-business related thoughts. What I've been reading, listening to, and watching along with some short thoughts on each. This is an audio-only edition to kick things off. Enjoy and see you next week. Duke Ellington live at the Newport Jazz Festival in 1956. There's an electricity in the crowd that makes these songs feel that much more alive. I've included only one song from the album, Jeep's Blues, but I'd recommend listening to it in its entirety. Also included is my jazz playlist on Spotify: a massive collection of my favorite artists and compilation albums from the genre. Recommend me something new in the comments below or shoot me a message. Harmlessness is an emo/indie rock album from the Connecticut-based, obnoxiously named The World is a Beautiful Place & I Am No Longer Afraid to Die. I put off listening to this band solely because of how long and pretentious their name is. Turns out that was a mistake. There are moments on this album that sound orchestral, overwhelming, and grandiose while other moments are subtle and understated. The album's overall sound is phenomenally textured and well-balanced. Listen to it. Read or listen to the book for yourself. "Most books about the history of humanity pursue either a historical or a biological approach, but Dr. Yuval Noah Harari breaks the mold with this highly original book that begins about 70,000 years ago with the appearance of modern cognition. 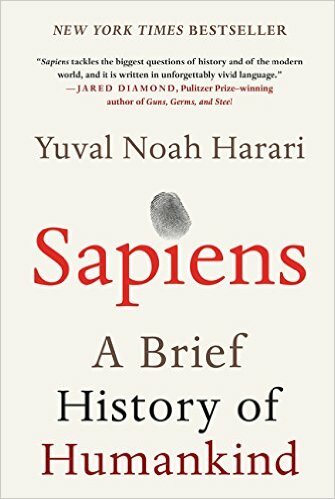 From examining the role evolving humans have played in the global ecosystem to charting the rise of empires, Sapiens integrates history and science to reconsider accepted narratives, connect past developments with contemporary concerns, and examine specific events within the context of larger ideas." Both Joe Rogan and Sam Harris put me on to Sapiens. I first heard Rogan mention it in a podcast episode and took a mental note to investigate the book further. Then Harari popped up on Sam Harris's podcast. It's an incredibly insightful discussion on the human conception of reality, fact vs. fiction, and what humanity's existence might look like in the near and distant future. Well worth the 90 minutes. Listen to the author's discussion with Sam Harris on the Podcasts app. Let me know what you think by shooting me an e-mail, reaching out to me on social media, or commenting below.